The seaside brings to mind certain staples; fish and chips, seagulls, ice cream cones, beach huts, sunshine and of course the arcades. A hub of colour and noise, the clink of the pennies, the music from the dance machine and the children running around asking for more. A cheap day out with fresh air and family fun. 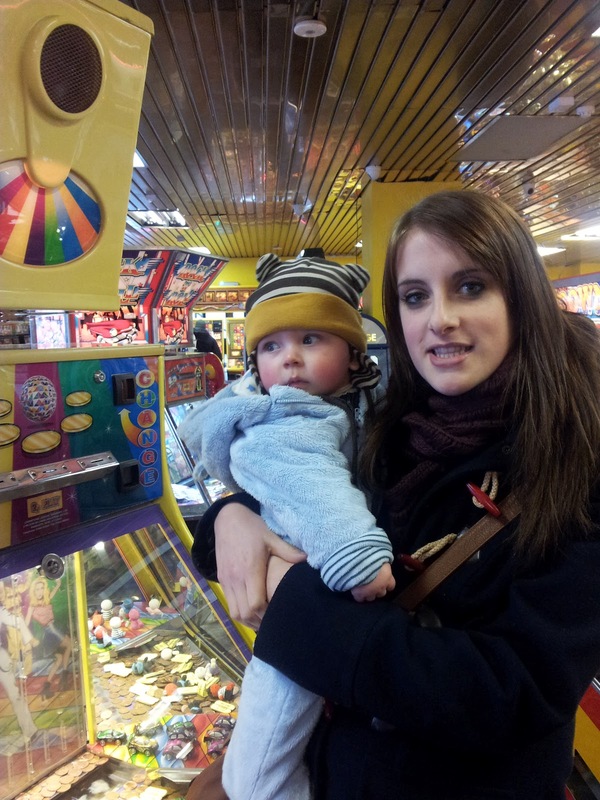 Dylan's first visit to the arcades started with a fight through the ice and snow (pushchairs and snow do not go), and ended with a very tired little boy. He seemed overwhelmed with stimuli and fascinated with the bright lights and colours. We played on the two pence machines in the hope of winning a fake Elvis Presley driving licence, and try as I might, I failed to win him a teddy in a zebra suit on the 20p grabbers. Living so close to the beach, i'm pretty sure that the arcades will be a back up plan for years to come, the fun and the relative cheapness is a winning combination, and it worked a treat brightening up our icy day today. Dylan (pictured with his aunty) was in sensory heaven. Nice to meet you! No tantrums today but maybe it was the novelty.